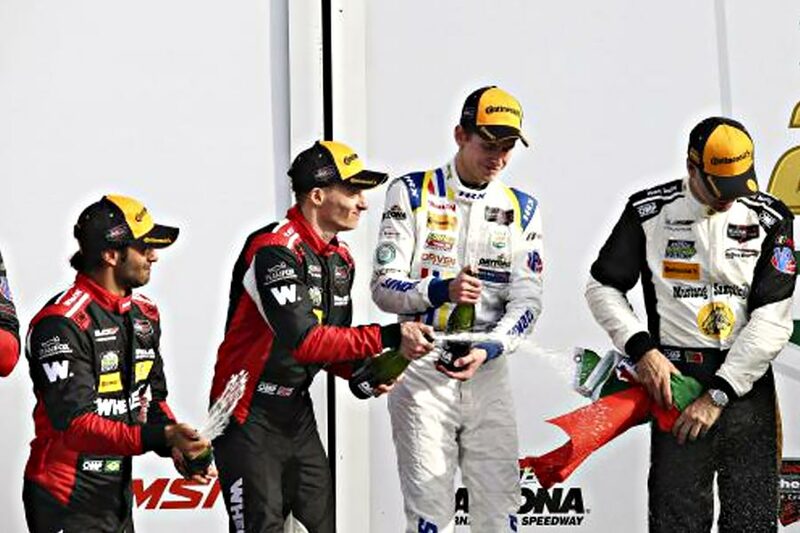 2017 Sunoco Whelen Challenge winner Stuart Middleton set new records at the famous Daytona International Speedway by becoming the youngest driver to claim a podium place this century. The reigning GT4 British GT champion made a fairy-tale debut at the Florida-based track, getting behind the wheel of his Cadillac DPI car to complete the final stint of the race. The distinctively red liveried Whelen Engineering backed-car had to back off in the final hours of the race to preserve the engine, ensuring the car was unable to challenge the race leader, and sister Action Express Racing car for overall honours. 2012 Sunoco Challenge winner Felipe Nasr started the race from seventh place on the grid but was on the move as soon as the race got underway at 2:40pm local time. By the end of lap one he was up to third place and in second by the end of his first triple stint in the car. He handed over to Stuart to take over the reins and the 18-year old delivered a mature drive, setting consistent times, and returning the car unblemished after two hours of hard racing. Driving duties were shared from then on between Eric Curran, Mike Conway and Nasr as Stuart did his best to stave off the flu. As dawn broke the car was holding third place with Nasr again behind the wheel but as the morning progressed the second placed Acura dropped away, promoting the number 31 car to second. A brief visit to the pit garage during a full course yellow allowed the team to solve a cooling issue without losing much time. The four drivers then split the remaining running as the Rolex clock counted down but, crucially, Stuart would have to run again as he had not completed the two hours mandated by IMSA. As a result the youngster had the honour of completing the final stint of the race and taking the chequered flag. With 808 laps completed of the 3.56 mile circuit a new distance record was set but Stuart also set new records of his own, becoming the highest placed Sunoco Whelen Challenge winner, beating the previous third place set by teammate Nasr in 2012, but more importantly the youngest overall podium visitor of the 21st century. “First and foremost I have to thank everyone for getting me here. The opportunity to race in the Rolex 24 is crazy. It’s something I couldn’t picture this time last year so to finish in P2 is just unbelievable, it has been an incredible 24 hours. It was a big learning curve for me, I was having to learn the car, the track, the tyres and the team throughout the weekend. I couldn’t have asked for better team-mates than these guys and the Action Express Racing team did a fantastic job. “That was a happy ending. I don’t think I’ve ever been quite so nervous. Stuart had a really good stint but beat himself down because Simon Pagenaud turned into him and they had contact. He was not happy with himself but from where we were watching he was amazing. He cut through traffic, overtook other guys, reeled in Pagenaud and it was an amazing drive.